Unicorn Riot has obtained a federal training manual, Field Force Operations, from the Federal Emergency Management Agency’s Center for Domestic Preparedness (CDP). 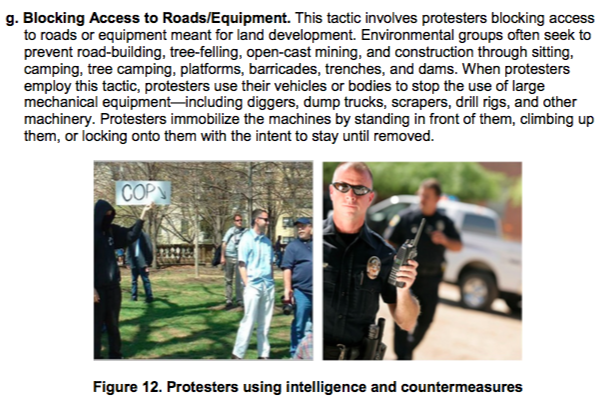 The federal government uses this document to train local law enforcement in techniques for quelling protests. It was acquired during our reporting on direct actions against the Dakota Access Pipeline when we filed a records request to the North Dakota Department of Corrections. An email from the cache released in response to our request shows a copy of this course being forwarded to state correctional employees, presumably in an attempt to bring their personnel up to speed with crowd control techniques after the onset of #NoDAPL protests earlier this year. The manual appears to be very recently revised, having been updated with references to Occupy Seattle “anarchist” protests and the Ferguson crackdowns. 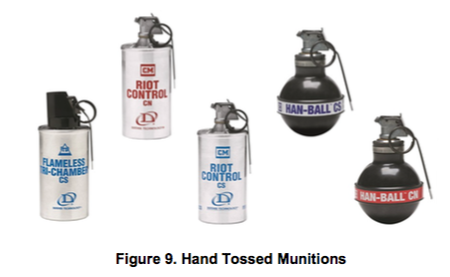 The 135-page guide has eight sections, covering “Mass Arrest“, “Team Tactics“, “Protester Tactics“, “Crowd Dynamics“, “Riot Control Equipment” and “Riot Control Agents and Less Lethal Munitions“. 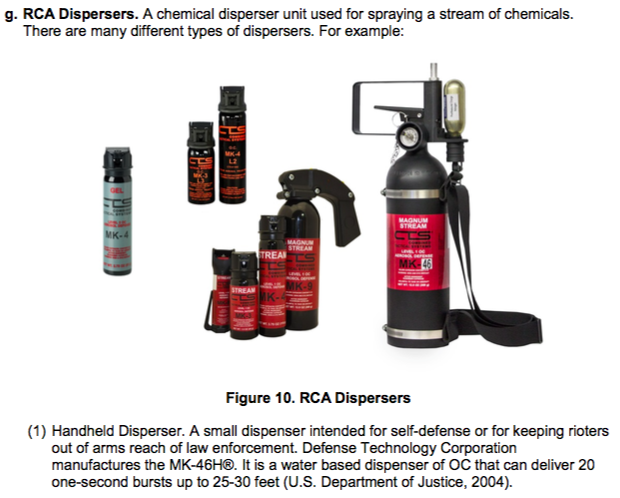 An appendix has lists of standardized riot control weapons, now commonly found in local police departments across the United States. 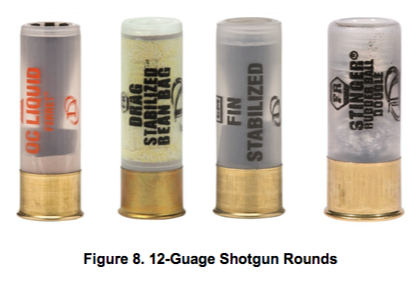 This manual summarizes tactics often spotted in recent years, as multi-jurisdiction task forces have utilized these approaches to reassert physical control over restive American communities. During campaign season, President-elect Donald Trump made it clear he wanted to execute policies involving millions of deportations, the cancellation of federal abortion rights, nationwide “stop and frisk” and many other proposals. 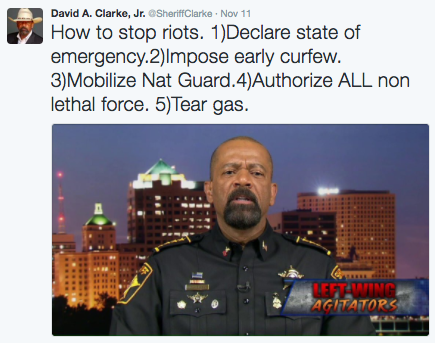 After the election Unicorn Riot covered large protests directed against issues like these in Denver, Minneapolis and St. Paul. Activist networks should expect similar tactics against many US communities in 2017 as they resist such policies. Trump characterized recent protest crowds on Twitter as “professional protesters, incited by the media, are protesting.” The label of “professional protester” is actually formalized in this FEMA training document. In Module 6, FEMA trains local police to believe that “professional protesters” are not like “everyday citizen” or “anarchist” protesters, and take action accordingly. Mutual-aid agencies should receive proper training prior to deployment to the field (Police Executive Research Forum, 2011, p. 34). Module 1′s Annex A. references a lot of previous protests in detail, including the 2008 Republican National Convention. 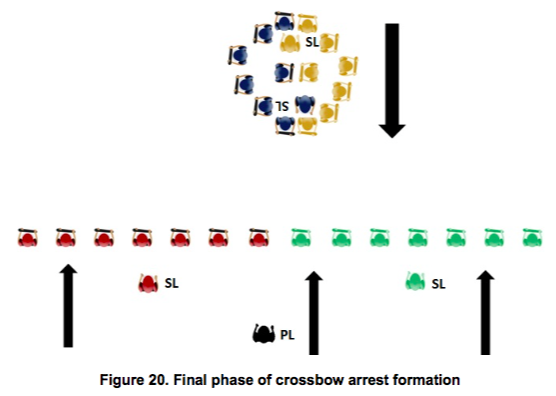 Module 2 covers mass arrest tactics including patterns of grabbing protesters. 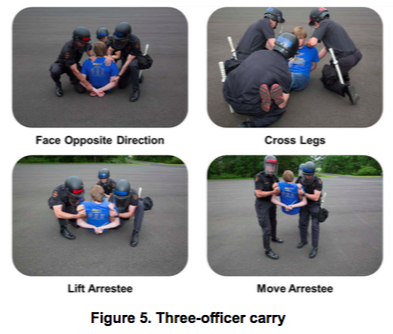 Module 3′s “Team Tactics” is important information for anyone at a heavily policed protest, as it contains a recent version of widely trained law enforcement formations. The Mobile Field Force (MFF) set of tactics is was developed in Miami (pg. 30). At the recent cross-jurisdictional crackdown against the Oceti Sakowin treaty camp along the route of the Dakota Access Pipeline, similar MFF tactics were employed, including “riot control agent” and “less lethal munitions” grenadiers, working in 8-person teams (pg. 31). Formations noted include; double-column, counter-column pivots, line, wedge, encirclement, lateral support, separation, crossbow line, crossbow arrest, and crossbow rescue formations. This also includes hand-and-arm signals to pass along each command. Module 4 features language and training on legal considerations with the 1st, 4th, 8th, and 14th Constitutional Amendments specified. Recent court cases regarding filming or photographing police are also included. Module 5′s “Protester Tactics” features a litany of recent protest tactics, including Occupy actions, labor, national conventions and environmental movement occupations. Sources from the old days, like a 1967 FBI crowd control manual, define categories further: Impulsive, suggestible, cautious, yielders, supporting, resisters, psychopathic (pg. 108). Author Raymond Momboisse’s Riots, Revolts and Insurrections, are heavily referenced to define crowd behaviors, including: homogeneity of mental state, contagion, suggestion, imitation, anonymity, sense of power, release from repressed emotion, rumor and novelty (pg. 109-110). Under Additional Protester Tactics, on page 96, it’s written that “media passes that gain access” can be a source of “infiltration“. Critical mass, unarrests, caltrops and the “ancient device” of the catapult, all get mentioned, along with “hazardous substances” in “large water guns“, caches of feces, and even mirrors (pg. 99-101). 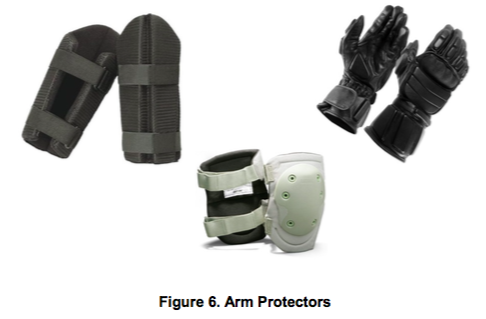 Module 7 has the gear that law enforcement wears for enforcing physical control. 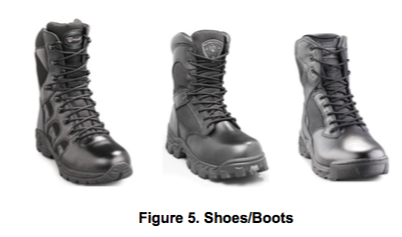 Module 8 is packed with nationally standardized riot control gear specifications – recommended for anyone wanting to spot when a grenadier is preparing to hit people with chemical weapons, for example. 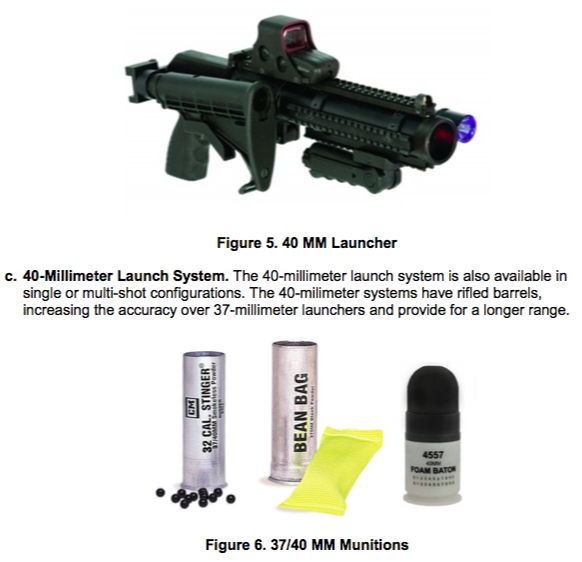 Update Nov 24th: Riot control gear sold by Safariland is heavily cited in this section of the manual. A concussion grenade from Safariland is believed to have severely injured one water protector and a claimed DDoS attack took Safariland’s sales website offline. FEMA is a large agency with a critical role in security: besides training local police with this material, it’s also a lead agency in the largest national security mobilization events, and has a special role in managing the civilian side of domestic military activations. To illustrate the next major FEMA-related security operation, consider next January’s presidential inauguration. If previous patterns hold, a National Special Security Event (NSSE) planning framework will have FEMA leading the emergency response, with overall control by the US Secret Service and military command by the Joint Task Force / National Capital Region. This NSSE will run several days around January 20th, 2017 around Washington, D.C. as Donald Trump is installed as president. At least through the 21st, Trump’s first full day in office, the NSSE structure will continue running with FEMA leading emergency response. Federalized domestic military activity, under figures like Milwaukee County Sheriff David Clarke or Rudy Giuliani, could unfold during a Trump presidency. FEMA regional offices would play a major role in that kind of situation. June 20, New Cleveland RNC Police & Military Docs: FEMA Base to Setup at NASA. Research Annex: Extra information for further research on domestic military intelligence activity, telecoms and more. This link includes more on National Incident Management System (NIMS), military-grade spy aircraft, and parallel comms networks, such as GETS. The legal authorities exercised by military personnel activated domestically, depends on which official calls them into action. Typically, National Guard personnel are activated by state governors, but federally commanded plans have existed since the aftermath of the 1960’s urban insurrections. This DoD planning architecture was entitled “GARDEN PLOT” until 2002. USNORTHCOM, set up as the Department of Homeland Security’s Pentagon counterpart, reorganized GARDEN PLOT into the secret “USNORTHCOM CONPLAN 3502” entitled “CIVIL DISTURBANCE OPERATIONS“. Proof that CONPLAN 3502 could be activated with federalized National Guard troops in the event a civil disturbance “exceded (sic) T32 [Title 32] capabilities” was found in a Powerpoint file left on an Army Corps of Engineers webserver and discovered and reported in 2010 by a member of Unicorn Riot. The slides discovered in 2010 described how Colonel Francey, of US Army North (ARNORTH), was responsible for overseeing revisions to CONPLAN 3502, and had refined the plan in the aftermath of the heavily militarized 2009 G20 NSSE in Pittsburgh. This established a link between NSSE activity and ARNORTH’s overall ‘martial law’ style contingency planning. Hypothetically, President Trump and DHS Secretary Clarke could agree with a governor that what they deem a “civil disturbance” had exceeded “Title 32” authority and simply swipe aside domestic limitations traditionally known as “posse comitatus” on federal military control. Thus, they’d activate the fully federalized CONPLAN 3502, which would put the Pentagon, rather than the state’s governor, directly in control of the targeted population. Please see “NORTHCOM, Civil Disturbance Operations, FEMA DCO teams, Conplan 3502 & Defense Support of Civil Authorities” for further details.